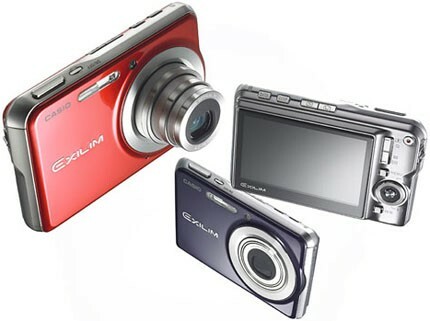 Casio has produced many slim digicams and become the trend for its Exilim series. The company's latest EX-S770 carries on the tradition, but not before increasing the resolution to 7 megapixels and adding a new data transport feature. 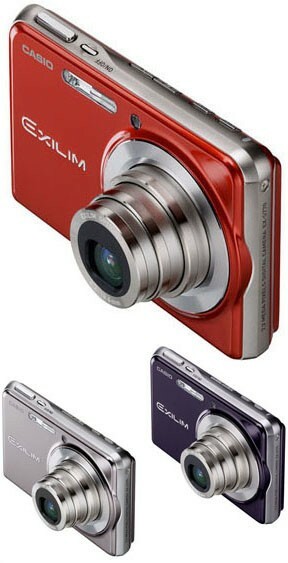 For a camera this thin, it's surprising the Exilim EX-S770 feels so solid in our hands. You get the standard fare of camera controls on the unit including Best Shot which refers to the various scene modes available and a Data button for the new data transport feature. The shooter has its drawbacks, unfortunately. The buttons on the top edge of the camera are relatively flushed with the surface, so users with larger digits might fumble with the keys in the dark. The same goes for the dedicated movie record button on the top right edge of the unit. A larger LCD might not necessarily be a good thing, too. Yes, you get more real estate on the panel and it's a joy sharing pictures on the camera. But the same 2.8-inch monitor eats up a considerable amount of space for the main camera controls, which are cramped to the right of the unit. It could be a design flaw, but if you're using a miniSD card with an adapter on this Exilim, don't bother taking any pictures because the camera will automatically push the lock mechanism on the media into position when you slot the card in. Like the rest of the digicams under the Exilim umbrella, the EX-S770 comes with an abundance of scene modes--31 at last count--for almost every shooting occasion conceivable. If that's still not enough, there's also an option to register your own Best Shot setting. A worthy mention is the column of quick access menus on the LCD screen. From here, you can easily set the resolution and cycle between various flash, focusing, white balance, exposure compensation, timer, ISO and date options. Hit the Display button and it'll call up a row of four tabs for different screen settings. Casio's new data transport feature is a novel idea which can be quite useful. With the bundled cradle and software, you can connect the Exilim to your computer (PC and Mac compatible) and convert business documents, emails and HTML files to JPEG format so you can read them directly from the camera. While the shooter looks good with the docking station on the desk, it is a hassle to bring an extra accessory around. Unless you have an external card reader, you're going to have to lug the dock around if you want to transfer your shots. Other basic features comprise a 38mm-to-114mm, 3x optical zoom lens, VGA (704 x 384 wide-format also available) movie recording and controls for adjusting sharpness, saturation and contrast. Like most other compact shooters, you cannot zoom in optically while recording motion images, but you can take a still shot in between which will be registered as a short pause in the movie file. The EX-S770 uses digital image stabilization which helps to reduce blur in your photos, but it shouldn't be confused with its optical or mechanical stabilization counterparts. Digital image stabilization post-processes your images so there is bound to be deterioration in image quality. We powered up the camera in 1.5 seconds and could shoot every 2.7 seconds thereafter without flash. With forced flash, the Exilim slowed to 3.8 seconds between frames. Shutter lag was measured at a speedy 0.1 second in bright light. Burst mode was sluggish, though. We managed to take only 25 7-megapixel images in a minute, which worked out to be about 0.4 frames per second. Image quality was rather disappointing. We liked the colors on our day shots, but the EX-S770 gave us less than satisfying image quality. You can select from four sensitivity settings up to ISO 400, though you won't want to shoot at the maximum ISO due to the amount of noise. Purple fringing and blooming were also problems in heavily backlit shots. We saw some vignetting and softness at the corners of our pictures. I am not very familiar with digicams i have a mini sd in mine and most times when i take a picture it comes as card error.